So today it's a bit of a diversion from our usual topics - and into the world of games, albeit one that's largely interactive fiction. I've been playing a great deal of Sunless Sea this year (too much Sunless Sea? Never! ), and thought I'd chat about it on the blog. Sunless Sea comes from Failbetter Games, the company responsible for the browser game Fallen London, and indirectly for all your sad feelings about bats (they're probably also responsible for that strange hunger you've been feeling lately, if you experience certain parts of FL content...). So they've got a pretty good - if a little grindy - interactive fiction track record. 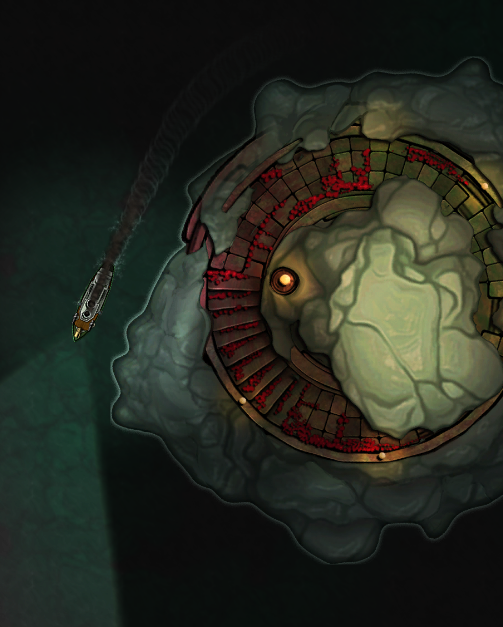 Sunless Sea is a different take on the formula, putting you at the helm of a steamship on a vast underground ocean and inviting you to explore. As the tagline "Lose your mind. Eat your crew." suggests, the survival expectations are not high. The Chapel of Lights? Seems like a nice place. Docking: the story side of the game. So now I've set out what I love about it, how do the mechanics measure up? Out on the Unterzee, you'll be balancing four main resources: Supplies, Fuel, Terror, and Crew (and there comes a terrible day when you make the realisation that crew are cheaper than supplies). The first two are relatively straightforward, if requiring you to balance whether you can really afford to risk that trip out into the unknown against the possibility of discovering a new island. Terror is a little more of a worry. 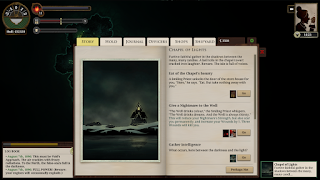 While it lost some of its bite in the final releases, terror represents the fears of your crew and yourself as you sail a fantastical sunless ocean. As it rises, new events occur - you can even find yourself recruiting a possibly-imaginary officer. At 100, your crew mutinies. 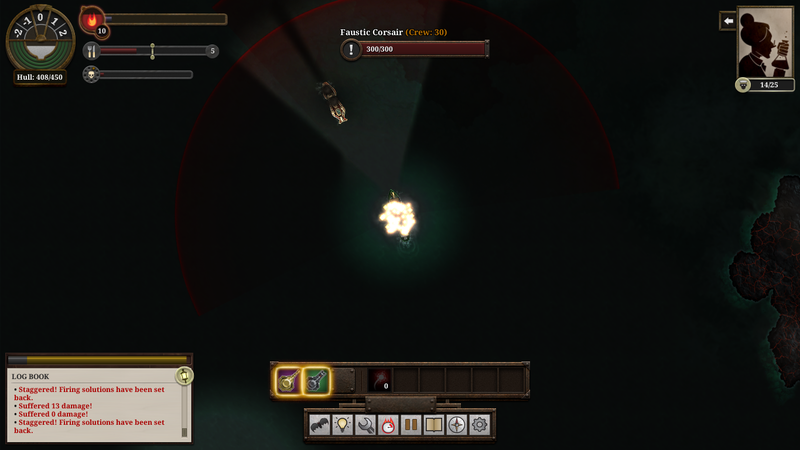 Terror increases faster when sailing away from light and shore, but is largely increased by story events (something I'm hoping they increase further - while it's still a bit of trouble to manage, the high terror events are fantastic, so it would be nice to see terror become more of a risk again). The terror mechanic works very well, as do the others, but there is a problem: the speed. 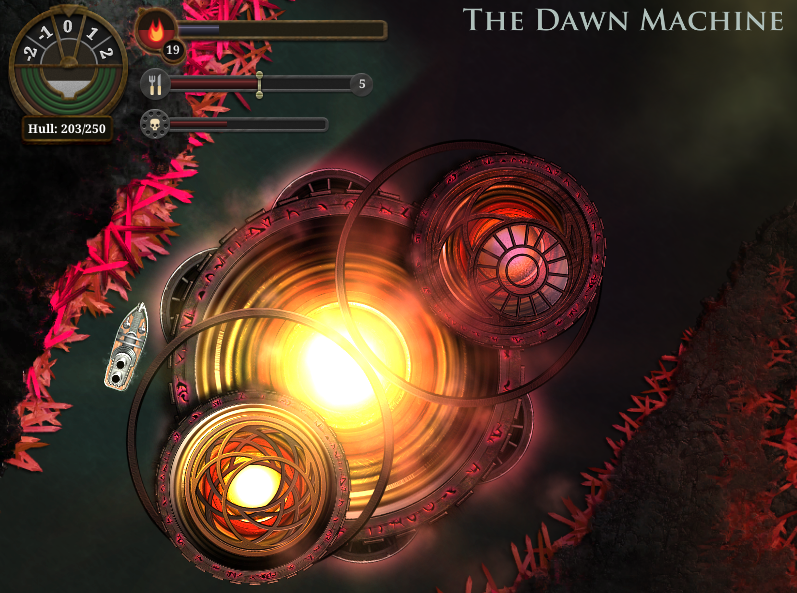 Sunless Sea is a slow game, mainly due to sailing speed with all but the fastest engines. A lot of the time, that's a good thing. The atmosphere is fantastic, due largely to a lovely soundtrack (you can find it on Bandcamp here), and sailing slowly through this vast map works well. Except for the roguelike elements, which means you tend to die a lot. Repeating early content at such an enforced slow pace can be offputting, so I recommend using manual save once this sets in. The content varies a lot more once you get to start making different decisions with different captains, and visiting different further-out islands, so this is less of a problem in the longer game. 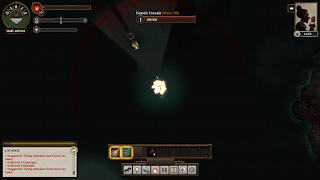 The combat involves manipulation of light and darkness again. Bring the enemy in your firing arcs, and you begin to prepare a barrage. If they're illuminated, this works faster - but naturally, turning our own lights on make them spot you much faster. 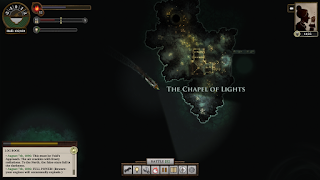 In general, it works well, and numerous small items found about the map make their own additions to combat: like glowing blue coral, which can illuminate the enemy, or the anarchists' Unclear Devices, which causes the enemy to lose you. However, it would be nice to see some more variation, especially in weapons, as well as the ability to board enemy ships, which currently is artificially extremely difficult but can lead to interesting events. The worldbuilding is fantastic. Though obscure and rarely directly stated, piecing together the clues to various mysteries from fragments of narrative is a downright pleasure. It's a lovely world: a world in which London was stolen from the surface as the latest in a long line of stolen cities. A world in which East acts strangely, and North is associated with hunger. Where Hell cast out its aristocracy, who now plot in exile. A world in which rats and guinea pigs go to war (on one fantastic island, at least). And the art works fantastically for all of it. Just take a look at the Dawn Machine! 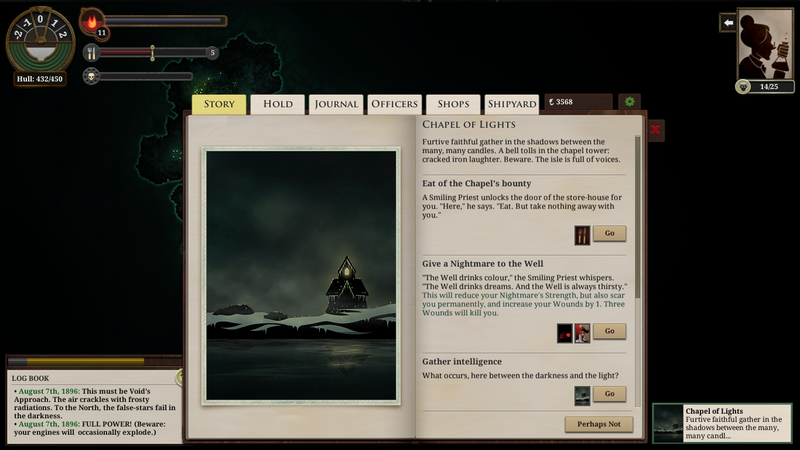 Altogether, I have to recommend Sunless Sea. It may have its flaws, pacing-wise - but overall, it stands as the most delightful game I've ever played. It's imaginative, quirky, and manages a variety of different tones and experience. Pair that with care for inclusivity (the romances have no care for gender, there are canon non-binary characters - alternating with he/she pronouns in one case, admittedly, but this was a kickstarter backer being written in who was apparently confirmed as appreciating this - and PoC in significant places), the ability to make utterly terrible decisions and eat your crew, and some truly fitting art and soundtrack, and you have a recipe for a winner.